How much trouble can six 11-year -old campers cause on a tour across the U.S.A.? Background: Canadian writer Gordon Korman retains a cultish appeal among a certain segment of Middle Readers, in part because (as stated in the Scholastic Book Services biographical blurbs) “he wrote his first book, This Can’t Be Happening at McDonald Hall! when he was twelve years old”. Three years later, at the tender age of 19, Korman would publish another book very much in the same vein, featuring another dry-witted, overly-gifted young hero whose scheming nearly drives his camp counselors to a nervous breakdown. Dennis finally convinces his friend that it will be a great way to meet girls, and in short order Rob finds himself behind the wheel of a large white van containing six 11-year old boys, destined for the first stop of the tour, New York City. Dennis beams that their charges are perfect specimens of Canadian boyhood, but Rob can’t shake the bad feeling he got when they stopped to pick up their sixth camper, Artie Geller, and his parents seemed to be very concerned that Artie not be given too much spending money. Artie seems normal, except that he totes a leather attaché case with him everywhere. However, by the time they get to New York the other campers have revealed their own obsessions and eccentricities; quiet, mild-mannered Artie is the last thing on his mind, despite the constant presence of his mysterious attaché case. Artie turns out to be some kind of an evil marketing genius, as he unleashes his first enterprise upon the unsuspecting city, selling “Attack Jelly”, which becomes the hottest novelty since the Pet Rock. 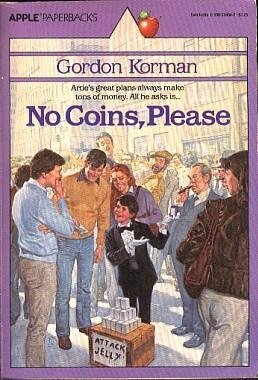 As the group travels the country, Artie escapes from the group in every city, undertaking a new cash-only business to bilk unsuspecting rubes. While the already-nervous Rob becomes successively crazier with each passing day, Dennis reasons that Artie always returns unharmed, and concentrates on buying continuously more ridiculous souvenirs, and is soon driving around a van full of bald eagle shirts, sombreros, and Indian war bonnets. In Pittsburgh he buys a “16 pound lump of pure steel”. It’s not until they reach the Double-J Juniortours Jamboree in Ogallala, Nebraska, that Rob and Dennis realize what’s been going on. Noting that city people vacation in the country (and vice-versa), Artie arranges to rent six cows from a local dairy farmer and charge the vacationing city slickers in the RV park a dollar a minute for the opportunity to milk a genuine Nebraskan cow. While Rob and Dennis redouble their efforts to keep Artie in check, he still manages to slip away for three days in Denver and open an exclusive discotheque in an abandoned pretzel factory. By this time Artie has made more than $60,000, which he keeps in his locked attaché case; Rob and Dennis realize too late that the next-to-last stop on the tour has probably the worst place to take Artie Geller: Las Vegas. Artie immediately vanishes in Las Vegas, paying a visit to a Hollywood-style makeup studio where he emerges as a diminutive octogenarian who only communicates in sign language and is a whiz at counting cards. Late in the plot we’re introduced to a couple of FBI agents who have been baffled by reports of “the kid in the tuxedo scam” that has been turning up across the U.S. over the past several weeks, which strangely coincides with the Juniortours stops. In the hysterically funny climax, the five other campers come to “rescue” Rob, Dennis and Artie from the clutches of the FBI, Mr. Butcher and various casino security guards, while “disguised” in Dennis’s souvenir wardrobe and armed with his 16 pound lump of pure steel. In the chaos Artie (still in his little-old-man makeup), escapes and gets as far as boarding a flight to Toronto before it is ordered back to the gate. The Canadian government would protest, the American government would apologize, Agents Newman and O’Reilly would come out villains, and everyone would forget Artie had done anything wrong at all. He would immediately become a folk hero, with a host of imitators. The implications were staggering. Even though he had violated an incredible number of laws, his schemes had never really hurt anyone. The FBI levies a massive number of fines upon Artie, in the amount of over $150,000, which he pays out of his accumulated winnings. This leaves him with exactly $2.96 more than he started out with in Montreal. In the interest of keeping things quiet, Mr. Butcher allows “you Canadian guys” to conclude the tour, and the book ends with Artie briefing his fellow campers on how to get started in the Attack Jelly business once they reach Los Angeles. Sign It Was Written In 1984 Department: The campers are all big Expos fans. This entry was posted in Vintage YA Fiction and tagged 1984, Apple, Author K, Humor, Scholastic, Summer, Summer Camp, Title N, Travel. Bookmark the permalink.